The world is accelerating. Although nowadays the uncertainty of the international development path is perceived as a constant, strategic competition between the states continues to rise. Lacking a defined vision of the future, the subjects of international politics are afraid of losing their positions and time, looking weak, which makes them behave more assertively. As a result, foreign politics is becoming a kind of reaction game, where the winner is the one who is more skillful at deflecting new crises. Nevertheless, this geopolitical acceleration has not yet become a new quality of the international system. It is impossible to describe modern world politics through one or several key rivalries – Russia vs. the West, the USA vs. China, the North vs. the South, etc. Similarly to guerrilla warfare with no single frontline, the geopolitical contest breaks down into separate hotbeds which unexpectedly emerge and disappear. On the one hand, the states steer away from admitting that they do not follow the peacetime schedule. Everyone anticipates new international crises. On the other hand, the structure of these anticipations is ruined. There is no understanding of what engenders crises, what their character and scale will be, and to what consequences they will lead. The previous risk assessment scale has also become irrelevant. This brings about a permanent threat of excessive, disproportionate reaction to the crisis from its participants. Politicians seek certainty, which makes them susceptible to simple explanations of what is going on, with the West, China, and Russia responsible for everything. An instinctive desire to simplify the world combines with actions taken under the misplaced certainties influence, i.e. the elite’s unjustified belief in their knowledge of the opponents’ capabilities and plans. This combination of motives will become the catalyst of the international crises in the new year. The American elites are sincerely convinced that Moscow elected a president that is uncomfortable for them. The misplaced certainty for Russia is an allegedly unfolding new Cold War with the West. There is no such war. The strategic competition between Russia and the USA is accompanied by the dissolution of the Western unity. The White House is playing against Germany’s interests in the EU, equally as actively as it is opposing Russia. The increasing number of strategically autonomous big players complicates the international environment and makes analysis more difficult. In this forecast we will cover nine situations of the coming year which are expected to deteriorate. 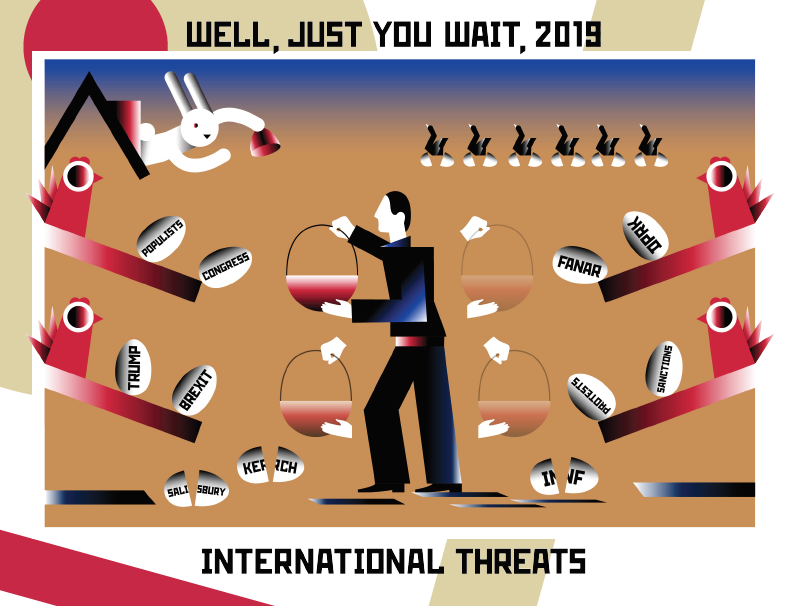 The new feature of the sixth annual forecast is that we deliver our own version of the future positive international events – for not only threats emerge unexpectedly. Good news should be acknowledged, too. The big competitors for the tomorrow’s pie cannot afford a direct confrontation with each other, as it is too costly and dangerous. A big war between the powers is impossible due to the nuclear escalation threat. Moreover, it is unclear what to fight for and even who is the enemy. The rivalry between the USA and Russia is rather emotional than rational. American desperate attempts to stop China are imbued with the fear of losing the most important trade partner. Western elites nostalgically dream of a recent black-and-white world, i.e. the world of the alliances of the Cold War. 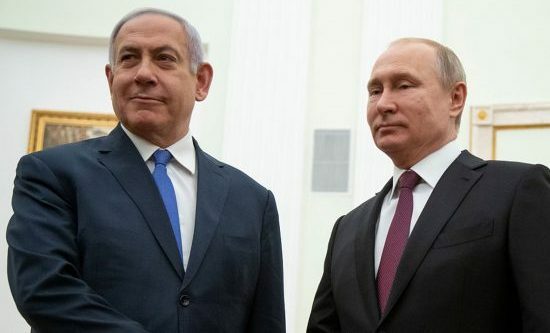 Being incapable of dominating the new world and afraid of exposing their weakness, they seek to compensate for the pettiness of their critique against Russia by theatrics. This is how provocations have replaced wars as a tool of competition. Media, spy, sports provocations, sometimes dirty and even involving innocent victims, push everyone towards the black-and-white world, for only this world has a demand for being mindless and capable of provoking and creating tensions, whether in Ukraine or Syria. A provocation is the simplest and cheapest way to add contrast to the world, if not to make it black and white. That is to make divisions along the old lines between friends and foes, return the world to the familiar state of confrontation and remind of the allegiances sworn in the past. The Western elite have a clear understanding that their primary task is to distract their people from the accumulated problems which they fail to solve, rather than to make the enemy surrender. In the coming year we expect new provocations in Syria which sees the activities of the leading regional players with high stakes. In general, the Middle East is “a resonator region” where weak impulses gain strength and bring about a manifold stronger political effect. It is especially relevant for the Syrian crisis. We expect new provocations from the Ukrainian government, too. This threat will grow as Brussels and Berlin are becoming increasingly disappointed in Ukraine and its reforms. Defiant actions against Russia remain the only way for Kiev to return to the agenda of international politics. The President and the Parliament election campaigns will multiply the effect. The festival of provocations is a good environment for small players which seek to encourage large countries to take forced steps. New spy scandals involving the exposure of “the Russian agents” or “Moscow’s hand” are certainly imminent. The clash of intelligence and counter-intelligence services itself will have a marginal role. It is media space that will become the main arena of spy scandals with the Western general public being its main recipient. The issue of cyber threats will resound. Yet, the use of cyber weapon is lacking evidence (we do not expect cyber states to lay their cards on the table, as nobody wants to act first without a considerable reason), this issue will acquire the discernible style of tabloid reports. Finally, the shamelessness of Western politicians and media in promoting the Skripal case will achieve a stylistically complete form in the coming year. Shamelessness will take the form of New Sincerity. We expect some Western media celebrities to openly state that any means, including deceiving the audience, shall be used in the fight against Russia. However, at a certain point even this will lose any demand. 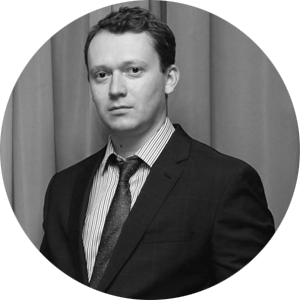 The Ukrainian provocation in the Kerch Strait did not lead to any escalation of sanctions. It cannot be ruled out that next year the audience will prove fed up with “the Russian threat”. Historically, the Western superiority in military technologies has been the source of its global dominance. Yet, the problem of any technology lies in the fact that the monopoly cannot be sustained permanently. It is possible that the next stage of technological development will see the new types of weapons reshuffle the odds. For the time being, nobody knows what sort of devastating potential cyber weapon may possess. It may become more available compared to the means of similar destructive power. The US global military leadership is still in place, but the challenge to this leadership is evident, too. Chinese intermediate-range and shorter-range missiles raise concerns in Washington. China and India are developing their navies, which may once challenge the American ones. An attempt to resolve the North Korean nuclear issue by force appears to be conducive to unacceptable risks. If one trusts the theory which claims that the world order is defined by the ratio of power potentials, the world has already become polycentric. Even hawkish John Bolton, President Trump’s National Security Advisor, has recently mentioned “missile multipolarity”, referring to China. One cannot exclude that having become too engaged in reviewing the agreements between Russia and the USA on controlling the nuclear weapons, the USA will fail to stop doing that. The logic adopted by the USA of “if you want to deter China, break a treaty with Russia” may encompass other agreements than the INF Treaty. 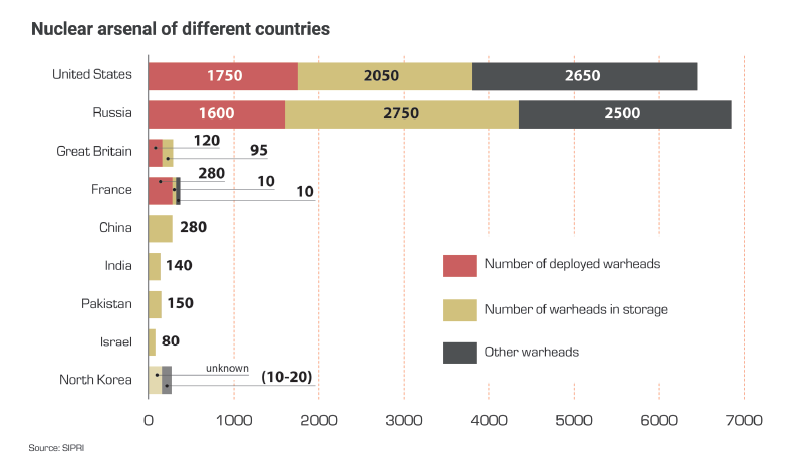 It is unlikely that new large multilateral negotiations on nuclear arms may occur in the accelerated world. Any negotiations of this kind will raise the issue of the US superiority in conventional arms, which many would seek to diminish. It is unacceptable for Washington, and will lead to further development of occasional polycentrism accompanied by building up stockpiles of conventional arms by everyone who can afford it. This situation is familiar to Russia. Moscow is an alternative to Washington as a supplier of a number of military technologies crucial for achieving military balance, which makes it an important player in the sphere of global security even without building up its own military spending. Armed polycentrism also means that major powers are ready to project power outbound, across the national borders. We expect a hike in building military bases in foreign territories, with Asian rather than the European states leading this process. 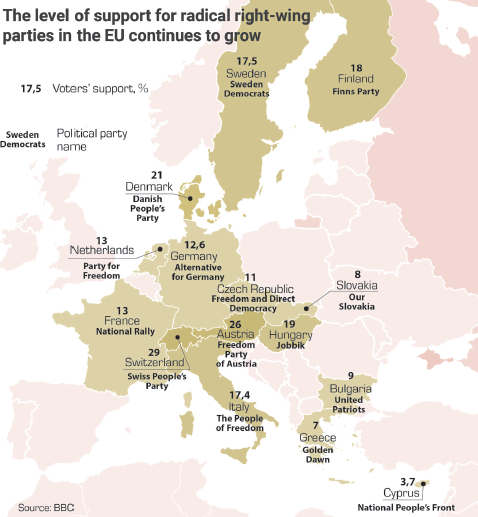 Political populism will continue to shape social and political agenda in the established and young democracies. The stability of this trend is predetermined by systemic reasons. Over the years, global economic growth has been accompanied by increasing socio-economic inequality within the countries; the elites have evolved into a “well-fed” establishment isolated from general public. Their key to sustainable self-reproduction is simplification of both political and ideological content of their programs. However, an identity-driven ideological struggle is returning. Technological development, reduced labor-intensive industries, increasing migration pressure have been changing the social fabric faster than most could adapt to it. It caused the rejection of the new reality exacerbated by growing wealth inequality. Amid alarming uncertainty, the opposition to “the others” – whether powers that be, minorities, or foreign enemies – has become a natural source of self-identification. Finally, social media have completely changed communication within society by leveling geographical distance and social barriers, once again having brought the electorate closer to the elected and depriving the elite of its former inaccessibility. Still, perhaps more importantly, Facebook, Twitter and Telegram with their high level of anonymity returned the “silent suppressed masses” an opportunity to directly express their concerns, search for like-minded people as well as form vast communities. Millions of online citizens cannot be ignored. In order to engage them in the electoral base, it is necessary to speak their language that is not always tolerant and politically correct. 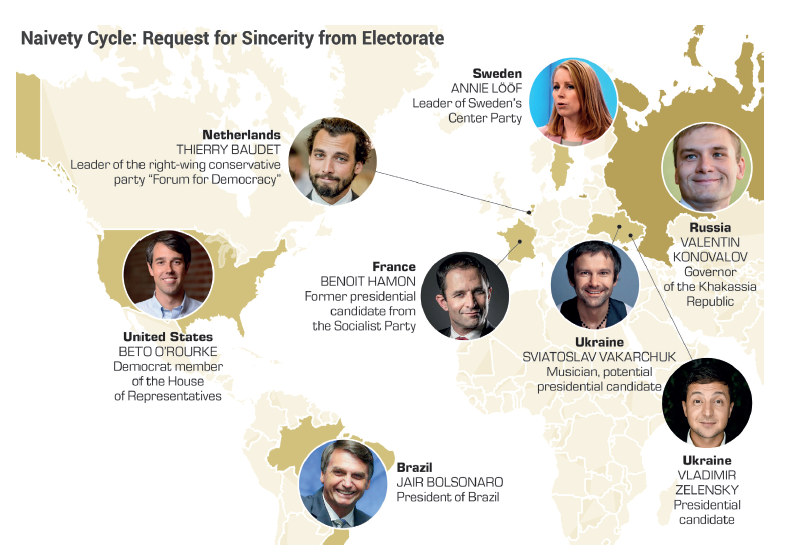 Bolsonaro, Salvini, Orban, Obrador, and many others are the leaders of the new wave, who have consciously or intuitively responded to the electorate’s request for a strong leader who opposes the establishment, who can speak openly and honestly, including tabooed issues, who has an ideological agenda. In turn, the “new media” managed to bring this image to the “core” of the electorate, often in opposition to the traditional media. Growing demand for justice, disposal of euphemisms, and “rectification of names” (we predicted it in 2017) remain the most important trend of world politics. The victories of the “new populists” in both Americas, Asia, and Europe are united by the phenomenon of “giving up democracy in favor of the rule of people” – when voters take back the rights to state governance previously devolved to elites. Populist policy is based on domestic issues. However, re-ideologization of political life already affects international relations. 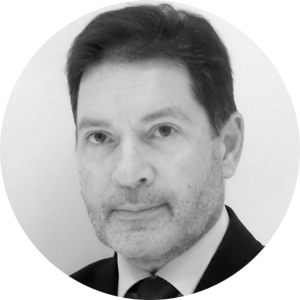 The US withdrawal from the TTP and the International Criminal Court, Brexit, the conflict between the Italian government and the European Commission, Orban’s policies – it is all the same reluctance to devolve authority to supranational structures, and the desire to put their own interests at the forefront. The re-sovereignization of the international life, its “atomization”, the crisis of supranational structures and integration associations will remain a stable global trend. 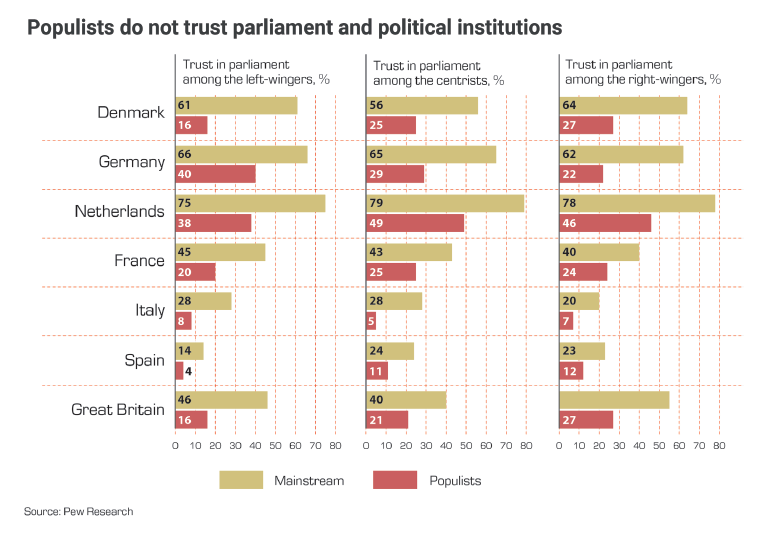 Another issue is that populist leaders are yet to prove their ability to come to power on an anti-elite wave as well as to create a new social and political order that meets the interests of voters. We do not expect that any of them will manage to succeed next year. Moreover, the failure of Emmanuel Macron, a “test tube populist”, put forward by the elites in response to the anti-elite protest, shows that political campaigning, however sophisticated, cures the disease ineffectively. New methods of strategic competition are being tested, including financial restrictions, economic barriers, information attacks, and provocations. Economic sanctions are gradually losing their original political meaning. Sanctions against Russia have not made it change the political course. The anti- Iranian sanctions were unilaterally imposed by the United States, whereas Tehran complied with the terms of the nuclear deal – such steps destroy any incentives for agreement and cooperation. Meanwhile, this tool is being ever often resorted to, which makes sanctions the routine of international economic life, i.e. another trade barrier that is hard to overcome. Sanctions transformed from a tool of foreign policy into a tool of foreign trade. Next year, the new nature of sanctions will manifest itself more clearly as new trade wars emerge. As economic sanctions are losing their political image as a “punishment for the dictators and outcasts”, governments will treat them more hypocritically; the attempts to circumvent the sanctions will be more active. Who, if not Russia with its constant efforts to maintain an effective anti-sanctions regime towards the EU, knows how it occurs? We believe that next year leading countries will find a way to avoid the US sanctions on trade with Iran. 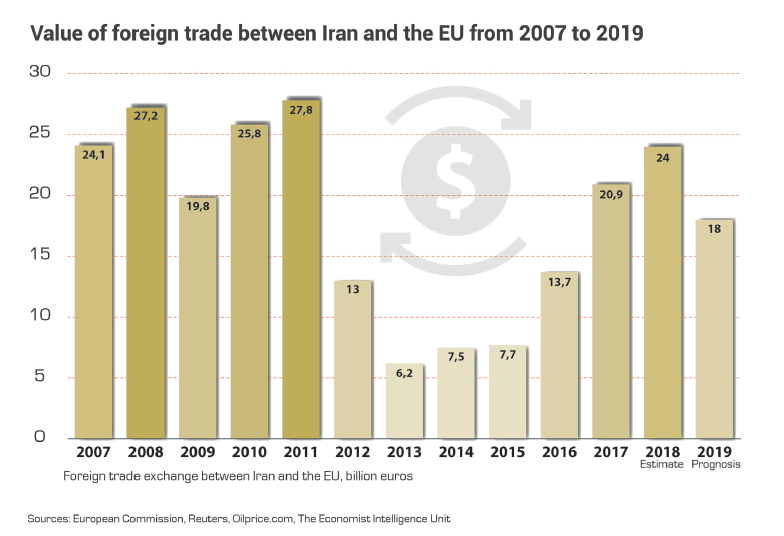 The EU has no political reasons to prevent its corporations from making money in the Iranian market. We also believe that Germany will not surrender under the American pressure, and Nord Stream 2 will be built and put online. Its importance for stable natural gas supply to Western Europe is so great, with the alternatives being so costly (like LNG from the USA) or ephemeral (like upgrading the Ukrainian gas transportation system), that political prejudices will not be taken into consideration. For the same reason, we do not expect that the European Union will impose new sanctions against Russia. 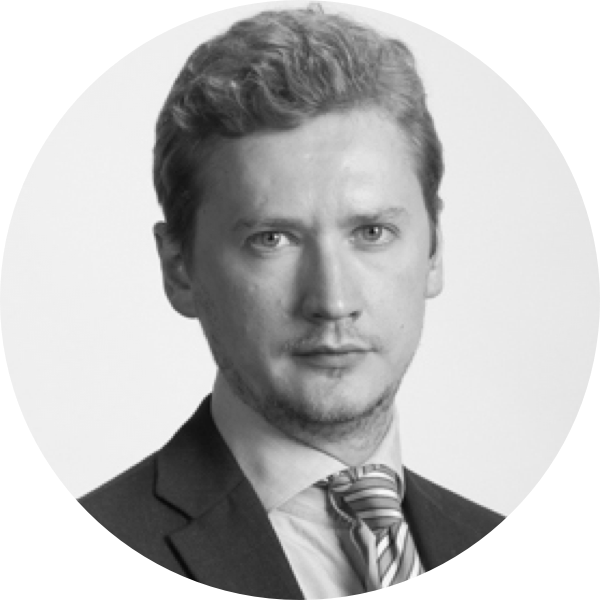 If the crisis in Ukraine does not follow the most dangerous path, Brussels will not be able to get a consensus on new sanctions from all the EU countries, especially due to the absence of tangible results of the already existing sanctions. The geopolitical acceleration forces key players to find flexible, but effective ways of projecting power, which gives them opportunities for dosing pressure. In the context of the resource-intensive ground operations of the past century and yet not widespread offensive cyberweapons of coming decades, naval forces will be of particular importance. The United States has demonstrated the effective use of the Navy as a tool for stating its foreign policy position without creating a security dilemma. Not being a signatory to the UN Convention on the Law of the Sea, over the decades, the USA has actively defended its main principle – the freedom of navigation in international waters – and under this pretext made demonstrative passages in the areas of territorial disputes and bottlenecks of the key trade routes. The key economies of the world – China and India – begin to try on the role of leading maritime powers. Contrary to Russia’s common vision of China as a part of the Eurasian land mass, Beijing perceives itself as a maritime power. The China Sea freight carriers control 18% of the world market; five out of ten largest container ports are located in the mainland and another one in Hong Kong; two thirds of the world’s container traffic pass through the China-operated ports; Beijing owns the largest number of coast guard boats in the world and more than 200 thousand fishing boats. 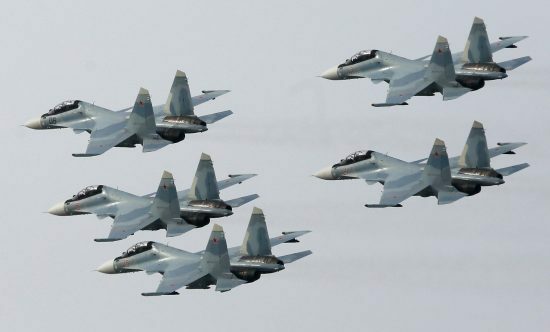 Apart from the critical importance of water trade routes for the Chinese economy, the maintenance of military superiority in the maritime space is also connected with one of China’s strategic planning pillars – controlling the island of Taiwan. The Indian Navy is the most rapidly growing fleet in the world. So far, New Delhi’s ability to project power in the sea domain is limited to the Indian Ocean, which is already important, given the trade routes passing there. Nevertheless, nowadays, the strategic documents and policy statements of the Indian officials demonstrate the ambitions of a global maritime power. In the sea space, Russia feels confident. Possessing a military fleet comparable to those of the United States and China, it increased nautical miles logged by the ships not only in the Black Sea, through which the military supply of the Syrian theater of operations passes, but also in the Atlantic and the Pacific. Rapidly reduced difference in the naval potentials in the China-India-United States triangle will lead to the projection of bilateral relations logic to the Pacific Ocean. Along with the intensified American-Indian joint exercises, the number of provocations and dangerous maneuvers of the Chinese and American Navies will increase. In addition to the already “hot” South China Sea, the ground for such incidents could be created by political instability in small Asia-Pacific states, particularly in Taiwan in the run-up to the 2020 presidential elections. It is notable that the danger of escalation is also acknowledged by the military of the two countries which in September-October 2018 agreed to strengthen the channels of emergency communication amid promptly deteriorating relations. The USA is on the edge of a new crisis. The economy is still stable and an economic recession should not be expected; yet, the problems which will lead to grave consequences for the whole world in three-year time are gradually accumulating. The 2007 catastrophe of the mortgage market pushed the US towards strengthening the regulation of the financial sector. However, the Trump administration has loosened these control measures and created preconditions for going over the old mistakes again. Obama did a lot to liberalize trade, but the tariff war with China and the EU initiated by Trump has been conducive to a supply deficit and spurred inflation. The US desperate attempts to contain the rise of Huawei and other Chinese flagship companies averted China from following the Western rules of the game. Protecting its achievements, Beijing will resort to dramatic actions by starting to close its market for the American and European competitors. The 2007–2008 crisis occurred due to debt problems. This time, the speculative bubble is emerging in the technological sector of stock market. Tesla company, which has not brought any profit for 15 consecutive years, is among the main disappointments. In 2017, it reached the point of financial losses worth 2 billion US dollars, though it has not yet reflected on the investors’ mood. Nevertheless, Tesla is showing first signs of going bankrupt. Elon Musk’s creative approach, though useful in inventing, has so far showed little effectiveness in management. Electric cars are enjoying demand but there are no industrial capacities to satisfy it. Trying to sell something you cannot produce in required volumes may lead to a disaster. The demand on Tesla production is more likely an exception from the rules. Generally, new technologies turned out to be in less demand in the American society than it was expected. Consumer attributes of the innovations did not result in booming demand. The data claim the American market of personal technological devices is close to full saturation. This year it has finally become clear for the investors. 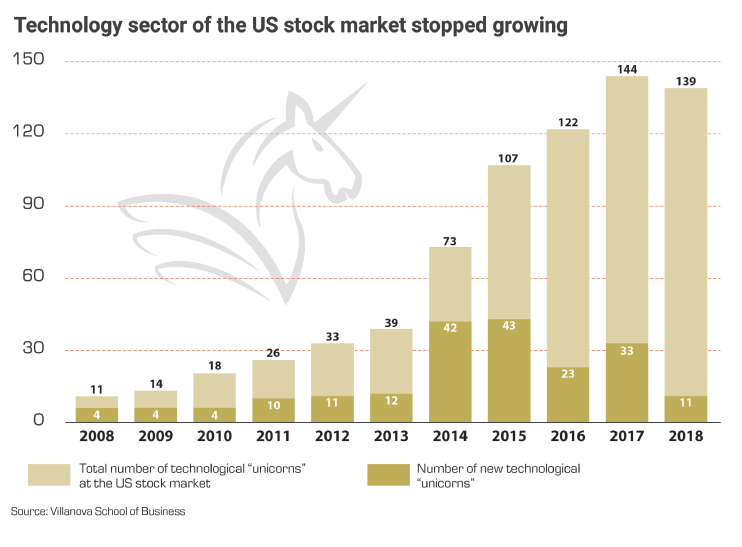 As a result, emergence of “unicorns” – venture companies whose capitalization exceeds 1 billion dollars – is becoming less frequent. In 2015, there were 43 unicorns, whereas in 2018 there are only 11 of them. The calculations made by the National Bureau of Economic Research demonstrate that the shares of these companies are two times overpriced. The stock market was the first to reflect this situation. A calm decade in the financial market is coming to an end. The 2007–2008 crisis led to political polarization in the USA, which has presently grown into a civil cold war. The new crisis threatens to exacerbate American domestic disputes even further. What unites Ukraine, France, Venezuela, and the USA? 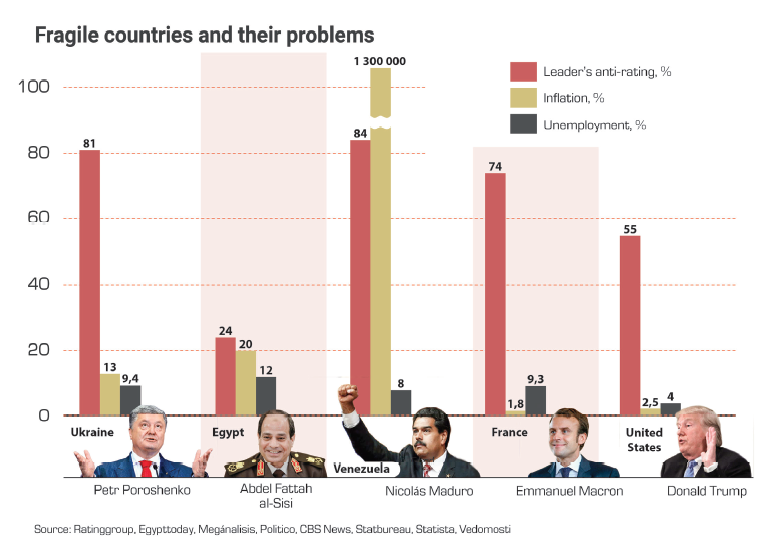 Exceptionally low ratings of the leaders. What unites Ukraine, France, and Egypt? High level of unemployment. All these countries either have experienced harsh rivalries in domestic politics in the recent past, or presently are in the throes of them. In Ukraine it manifests in the most radical form of a civil war. We assume that domestic political affairs fragility of these states may become a source of the international crises of the next year. Presidential elections in Ukraine are accompanied by a series of provocations in domestic and foreign political domains. The incumbent president’s retaining his office will cause massive discontent due to his extreme unpopularity. His failure to keep the office will be conducive to another reshuffle of offices and economic assets. The Verkhovna Rada electoral campaign will follow presidential elections with those who lost in the latter doing whatever it takes to take revenge in the Parliament. 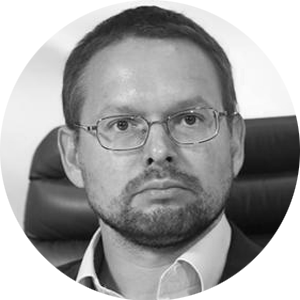 Consequently, the elections will only exacerbate chronic instability in Ukraine. The Egyptian government finds itself in a narrow room for maneuver. The country’s demographic structure, being functionally dependent, produces poverty, unemployment, and social disturbances. To feed the growing young generation is the main aim of the authorities. Foreign economic assistance and relatively small national income are exchanged for imported food. The situation on the global food market may have direct influence on the political stability in the largest Arab country. 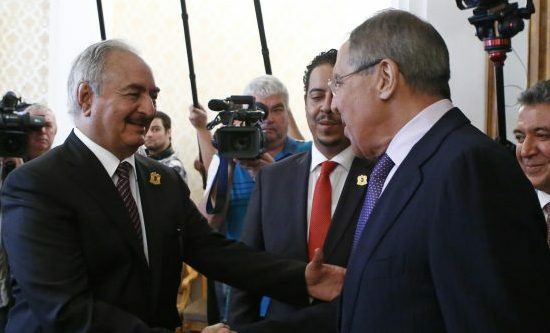 Russia’s bad harvest of crops threatens political stability in Egypt. We do not see any escape from the prolonged economic dive in Venezuela. The country is approaching the verge of resolving the domestic political crisis by force. The USA and Venezuela’s neighboring countries urge for an external interference. The recent visit of two Tu-160 strategic bombers to Venezuela demonstrates that Russia has no intention of abandoning its positions and assets in this country. Massive protests in France may weaken by the beginning of the new year; yet, it does not eradicate the fundamental problems which caused the outcry. France risks ending up among the troubled states of the Eurozone, alongside Greece and Spain. This will lead to a shift in the whole architecture of the EU with making a stronger case for Germany’s primacy, and at the same time raising the cost of leadership for the Germans. Khashoggi’s case has demonstrated that even if the crown prince Mohammed bin Salman wins the contest in the domestic political domain, he is not doing it seamlessly enough for his dominance not to cause doubts. Due to close ties with the USA, the kingdom exists in favorable conditions almost without any dangerous external pressure. However, the result of the struggle for power in Riyadh is yet unclear. In the new year, Mohammed bin Salman will have to stand another round of the fight for leadership. For the last two years, Donald Trump has brought a lot of new things to the political life of the USA – low rating, lost control over the House of Representatives, numerous scandals, and the wrath of the liberal circles. With the escalation of culture wars, the USA has become the harbinger of the trend of the Western domestic politics re-ideologization. Democrats will not be themselves if they do not try to impeach the President in 2019. It is high time we took a closer look at the vice president Michael Pence. Yet, it is impossible to count on the easing of the disputes between Russia and the USA in the present circumstances, whoever holds the office at the White House. In the world full of uncertainties, the legal guarantees of ally’s commitments have lost their value. Multilateral alliances continue to erode. We assume this will affect NATO as well as the Russian alliances. Turbulence awaits the CSTO and EAEU. In Armenia the new government views the alliance with Russia as a geopolitical necessity rather than a natural choice. This leads to a situation when even potentially very beneficial actions of Yerevan, akin to assisting the Russian operation in Syria, do not get the attention they deserve. The new team has limited experience in foreign policy, which will result in diplomatic tensions between the partners within the CSTO. Yet, the military staff will keep developing professional contacts within the organization in their natural course – political tension will not harm them. In general, year 2019 will test the institutional durability of the CSTO – how well do the alliance structures endure political circumstances in particular countries? 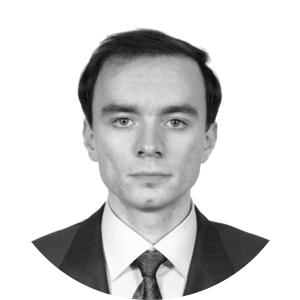 Belarus’s stance will make the EAEU suffer hard times. The more aware of its economic dependence on Russia Minsk becomes – which is more substantial for Belarus than for the other countries of the bloc – the more discernible are its attempts to weaken the Russian influence. Minsk will not resort to breaking the integration ties with Russia, but it will move further away from Moscow in political and cultural domains by broadening contacts with the EU, the USA, and China. 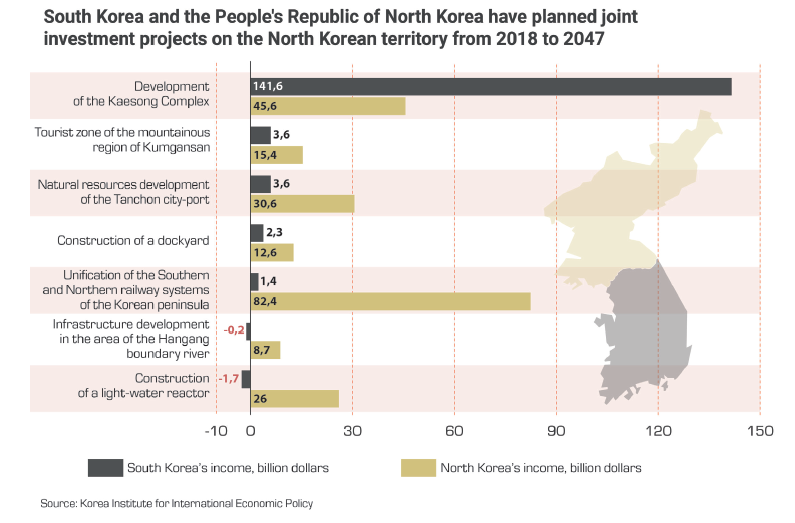 Multilateral alliances with their complex institutional structure will become relatively weaker, although the bilateral ties in the sphere of security will strengthen. It refers both to Russia, Armenia, and to the American allies in Eastern Europe, for whom the guarantees of sole NATO are no longer sufficient. It appears that military presence on the territory of a partner state will be regarded the most reliable guarantee. 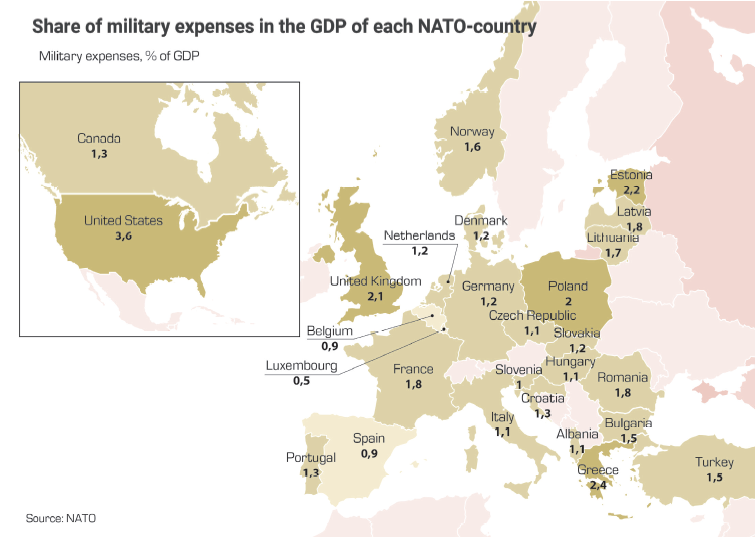 In their turn, the West European allies will continue upsetting Donald Trump, for he will not succeed in convincing them to spend more on defense. The erosion of alliances will make the very idea of legal security guarantees less attractive. Neutrality, non-alignment with the existing military and political alliances, refusal to create any new such alliances will become the choice for a greater number of states. Non-aligned movement will not emerge as an international political platform; yet, the example of such different countries as Indonesia and Uzbekistan, Austria and Finland will become the subject of an ever-careful analysis. The world does not leave the merry-go-round. After 4-5 years of the stern style in political leadership its softening is imminent. The people and the elite become tired of anticipating a new world war, whereas the politicians are being dramatic in showing the world their readiness to go all the way. The next cycle of leaders will provide us with soft – at least in their style – politicians. The whole world feels a growing need for sincerity bordering the naivety and capable of winning over pragmatism or cynicism. For the upcoming US elections, the Republicans will try to find a person who is not involved in the Mueller’s investigation, does not harass women, pays taxes and, of course, has no business with the Russians. The next elections will become a «minute of glory» for new “anti-Trumps”, and the best is to win. Beto O’Rourke, Democratic member of the House of Representatives, lost the Texas elections, but received an unprecedentedly high amount of donations for his campaign, although refused the money offered by corporations. This makes him one of the key hopes for the Democrats when it comes to the future presidential elections. Thierry Baudet, the leader of the right-wing conservative party «Forum for Democracy» assumes the Dutch wagon will break away from the European train just as the British one did – in the next five years the Netherlands will hold a referendum on euro or borders «that will destroy the EU». It cannot be ruled out that in the EU the Netherlands would play the role that was earlier the British one. In Brazil the «tropical Trump», ultra-right Jair Bolsonaro won the elections. In France Benoit Hamon, a socialist, lost the elections, but is now trying to tack up the horse in a yellow vest, criticizing President Macron’s «one hundred-euro alms» to the protesting workers. In Ukraine politicians who professionally hate Russia are pushed back by entertainers. Vladimir Zelensky is coming to the political stage from the pop-culture. In a TV series he has already portrayed a school teacher who became the head of state amid a populist wave. Every time the Ukrainian media speak of the actor’s rating, which is higher than that of president Poroshenko, the figure of entrepreneur Igor Kolomoisky appears behind the entertainer’s back. Apart from Vladimir Zelensky, the first chair of the Ukrainian politics is becoming increasingly obtainable for Sviatoslav Vakarchuk – the leader of a popular rock-band who does not have any anti-rating and has gone through the school of leadership in the USA. Finally, in Russia mayor of Yakutsk Svetlana Avksentieva has publicly cancelled all corporate parties of the local authorities, which was reported by herself on her social network public accounts, and the governor of Khakassia, a young communist Valentin Konovalov reflects on whether to make the birthdays of Lenin and Stalin public holidays. The process of re-ideologization of politics, with rationality and predictability stepping behind the curtains and thus ceding the world to values, will not return the elites’ credibility in the eyes of the citizens. Rapturous applause will only mean the success of short-term effects – the audience is tired of burlesque and is waiting for a sincere and calm dialogue. The failures of the stern leaders will cause demand for softness and empathy as key elements of political style and fight for credibility. We believe that the bloodshed in Yemen will deescalate. The armistice agreement signed just several weeks before New Year’s Eve indicates it is generally possible. We expect the war in Syria to come to an end in 2019. It will take some time to prepare and adopt a new constitution, to establish a new state and political order, but for most participants of the conflict the hopelessness of military methods will become evident. The remaining terrorist groups will be either destroyed or they will disperse across the world looking for more favorable regions for action. 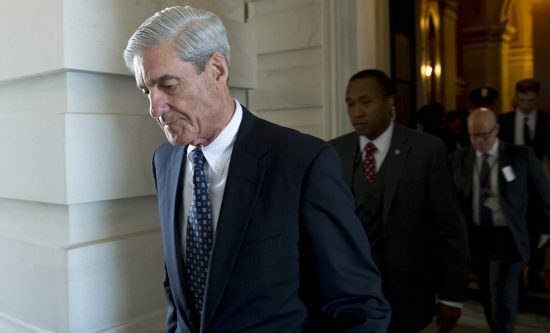 Mueller’s report on Russia will not prove any of the accusations aimed at the country – to be more precise, the accusations of Trump having a sort of a secret deal with Russia. This will to a certain extent decrease the tensions in the US domestic politics and might devaluate the issue of the «Russia’s hand» in general. We assume that next year there will be no war on the Korean peninsula, in Iran, in Ukraine, and in Karabakh. 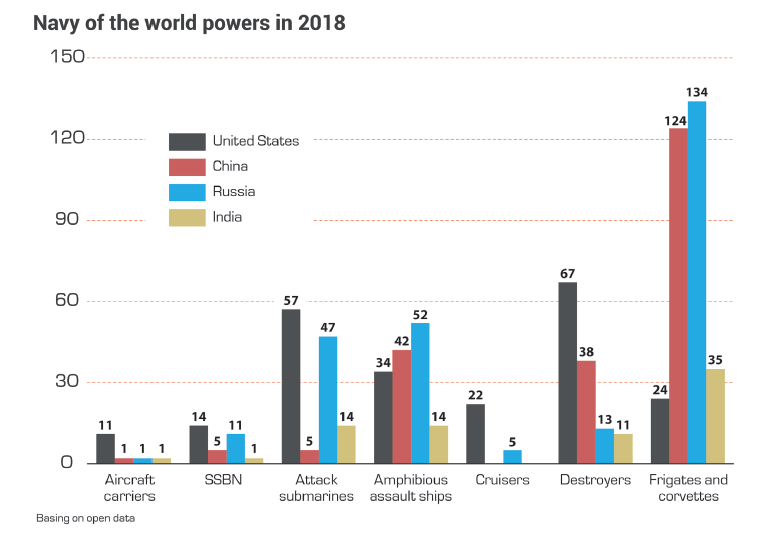 In all these countries or regions either there is a sufficiently stable power balance, or there are no political interests and goals that might push the key world actors towards a war. There can be some developments in terms of settling the conflict in Transnistria. A non-violent, constructive, even respectful interaction of the two banks of the river Dniestr serves as a positive example for the parties of all post-Soviet conflicts. Both Chișinău and Tiraspol are interested in remaining such an example, which requires some reciprocal steps forward. There are psychological circumstances for such steps, and the good will of Russia is obvious. High hopes accumulate around the possibility of Russia-Japan peace treaty next year. To make this happen the Kuril Islands issue should be addressed in the way that would be acceptable for both sides. The Russian-Chinese relations will grow stronger. Their value for both parties is increasing amid the confrontation with the USA. The issues of global security will become the main field for cooperation. In geopolitical acceleration politicians feel disoriented and find themselves dominated by misplaced certainties. However, in general, the world is used to uncertainty as a new norm. As it usually happens in difficult times, the electorate is not content with their governments. But it should be acknowledged that the governments are still able to manage. It was five years ago that we heard the first thunder of the crisis that we presently observe – Russian diplomacy secured Syria’s chemical disarmament and thus helped to prevent the USA from invading the country; in Ukraine the popular protests were underway, which later on led to a coup d’état. These five years brought many tragedies. The most important one for us is the civil war in Ukraine with thousands of casualties. But all the catastrophes that were coming to mind with the 100th anniversary of the beginning of World War I have been averted. In an era of total uncertainty being predictable is most important. An expected harsh reaction is better that an unexpected soft one. Predictability means reliability – in the eyes of both the rivals and the allies. The judgements should be made on the basis of the idea that provocations will doubtlessly occur. For a long time, they will remain one of the key languages of international communication, at least in reference to Russia. It is important, however, to avoid a reflective reaction to them – at least because in the end, their perpetrators are seeking to simplify the international politics to the level of reflexes. In the era of media diplomacy, it is of vital significance to preserve a dividing line between the direct reaction of the public opinion and the sphere of foreign policy decision-making. New and ever more absurd public accusations against Russia urge us to stop any attempts to explain anything or restore the dialogue with the accusers and their audience. Yet, this is a reflective reaction and merely because of being reflective it raises doubts. One’s actions, motives, interests, rationale must be insistently explained in details – even if there is no direct effect. It would be a mistake to believe that in a harsh era of hard power the soft power is not of any value. On the contrary, it is in these times that the soft power is of greater importance. First of all, explaining one’s position favors predictability. Nobody will say afterwards that there was no warning. Secondly, and more significantly, sooner or later, the present chaos will see the contours of a new order. This order will not be just a one of hard power, economy, and institutions – it will be an order of discourse. It will be based on a certain vision of the world, its description, a determination of today’s uncertainty. This order of discourse will be drawn in words. Russia will have to weave its own threads into the future pattern. Thus, keeping silent is counterproductive. Finally, one must sympathize and empathize. It is definitely hard to sympathize with those who occasionally promise to destroy you. However, in a world of unilateral communications, declarations with no expectation of an answer or tolerance to objections, empathy becomes the key value. Even if the opponents do not want to hear you, they must feel that you are listening to them and understanding their interests, motives, and concerns. «Listening» does not mean «agreeing». «Listening» means holding the door open for a constructive discussion. In the end, in an era of growing irresponsibility somebody must stay rational. 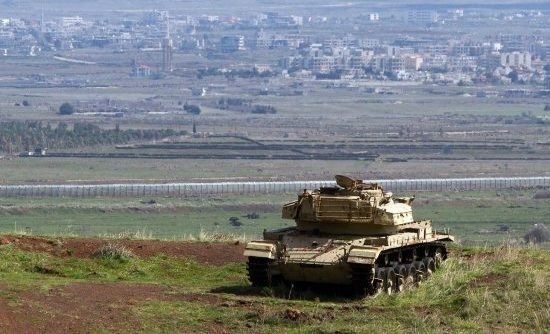 Will the Golan Heights Be Trump’s Height?